The Aesthetics of Composition in Abstract Painting: Artwork of the month: Maxfield Parrish and Skyrim. Artwork of the month: Maxfield Parrish and Skyrim. I have been playing the video game Skyrim a lot lately. And just to make a connection between fantasy paintings and this fantasy game I give you Maxfield Parrish. First off Skyrim rocks. An HD video game with 5,000+ hours of digital escapism hunting dragons. Seriously Skyrim just rocks and dragons have the best treasure. 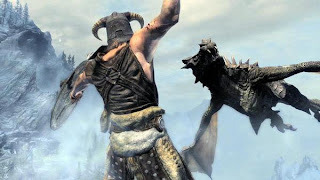 Skyrim was released at midnight 11-11-11. I know that because I was one of the geeks at GameStop in uptown Minneapolis for the midnight release with the rest of the entertainment hungry flock. As to Maxfield Parrish, I have never really liked his subject matter, albeit his technical skill at rendering realistic and painterly works is nearly unmatched in art history. I love the way his work appears as if it were a silver gelatin print. This painting is at the Minneapolis Institute of Arts where I spend way too much time, but not nearly as much as i have spent playing Skyrim lately. "Dream Castle in the Sky"
"I don't know what people find or like in me, I'm hopelessly commonplace! Current appreciation of my work is a bit highbrow, I've always considered myself a popular artist."